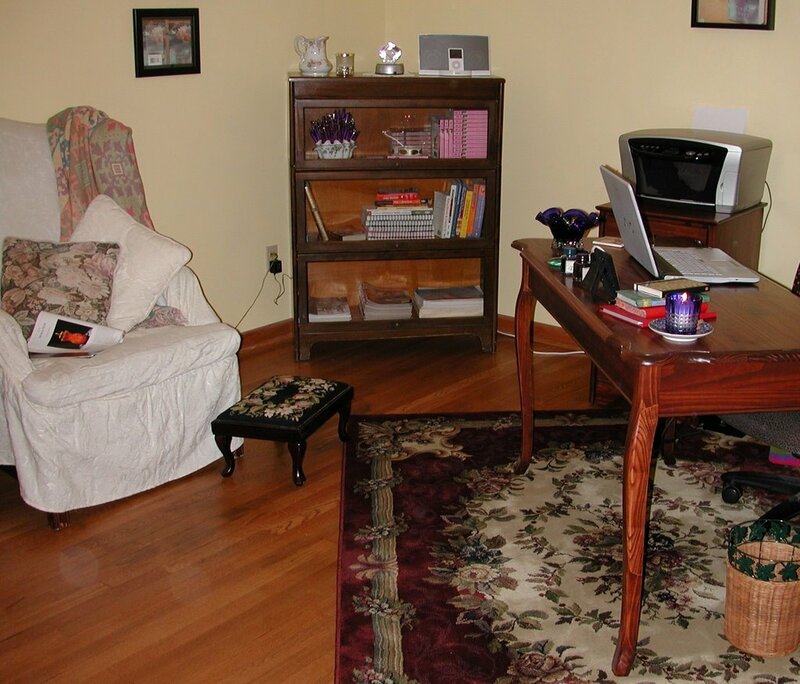 A year ago this month, I wrote about my home office and posted some pics. 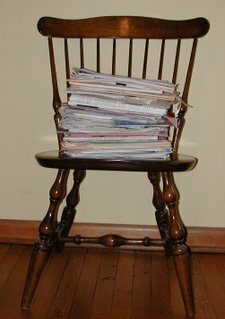 Last week, someone suggested that I blog about writers' offices and I said I did that already, sort of, but for those of you who weren't paying attention or maybe weren't hanging out at NRJW way back then, I'll do it again. My office looks pretty much the same as it did a year ago, except that we ripped up the carpet and refinished the 55-year-old oak floor and put down a pretty rug. Also, my husband recently purchased an old glass-front bookcase that I'm finding lots of uses for. He meant to refinish it, but I was too eager to start filling it up, and I don't mind the scratches and dings. I still insist on having fresh flowers--or at the very least, flowering plants--in my work space, so I don't know how to explain the fake rose parked on top of this antique mirror. I detest artificial flowers and plants, but I can't help smiling when I look up and see that silly rose. 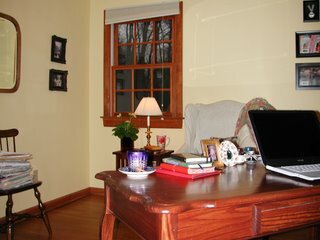 I could have chosen a larger room for my office, but I like small, cozy spaces and besides, one of my windows looks out on the back garden and the other has a huge lilac bush right next to it. (When I open that window in the springtime, the heady fragrance nearly makes me swoon.) 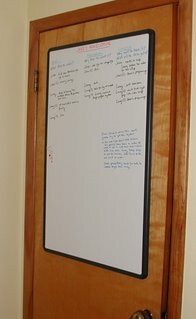 I like to work with the door closed, which is why this white board, on which I work out story questions for my novels, is mounted on the back of the door. Also useful is the bulletin board (not pictured) on the wall behind my desk. Plain old cork didn't do anything for me, so I prettied it up by covering it with some rose-patterened drawer liners from Crabtree & Evelyn. Here's my reading corner. On the TBR shelves are a John Grisham novel, a collection of P.G. Wodehouse stories, The Rise and Fall of the Roman Empire, a poetry anthology, and some other goodies--but no romance novels. This room feels more like a sitting room than an office, and that's why I like it so much. Apart from my laptop computer and a simple printer, the only hardware in here is a BOSE docking station for my iPod. 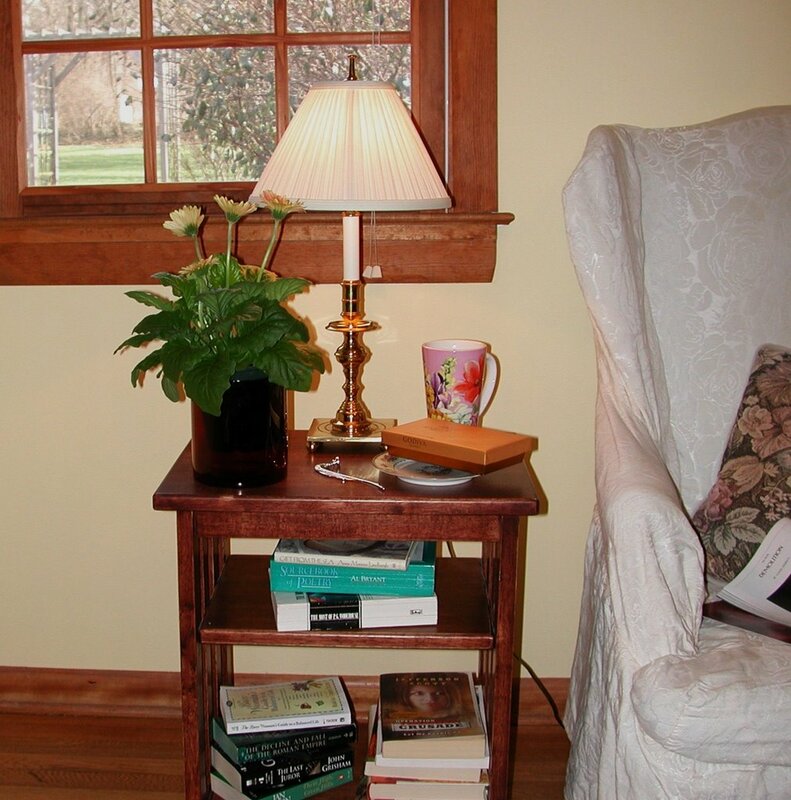 I scatter china and plump pillows and candles and flowers everywhere, and I don't keep a phone or any clunky office accessories like staplers and page-a-day calendars on my desk. 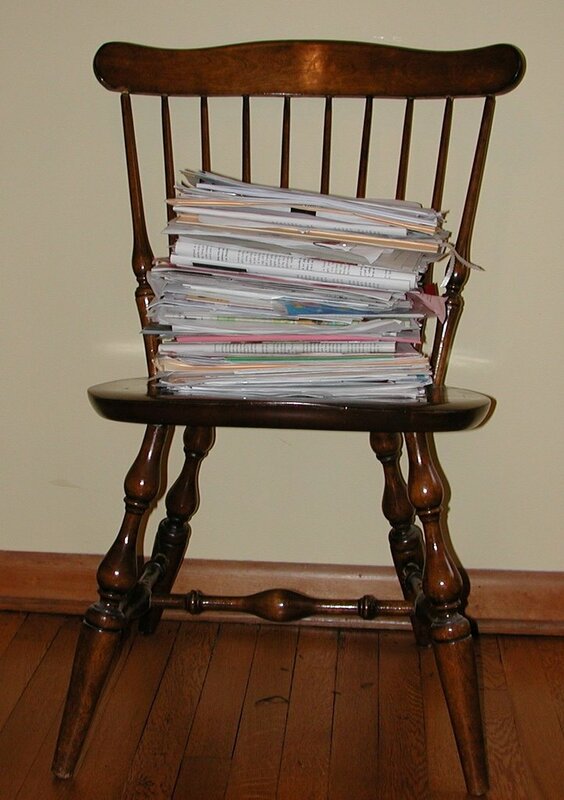 Even the oak filing cabinet looks like something that belongs in a bedroom rather than an office. Years ago I read about William Morris, father of the Arts and Crafts movement, the guy who insisted, "Have nothing in your home that you do not know to be useful or believe to be beautiful." That was easy for him to say, I grumbled to myself; he didn't have a husband and two rascally boys scattering all sorts of weird things around the house faster than he could pretty it up. For most of my life I wished for a room of my very own, a room with nothing in it--nothing--that wasn't handpicked by me for its usefulness or its beauty. It was just three years ago that I finally got my own room, and words can't express how much I have enjoyed it. If you have pics of your writing space on your blog, leave a link in the Comments. OOh how fun! I did a post like this back in September and I remember your original post too. My office at home (not a full time work office, I should add) is so awful that I couldn't possibly share it. It's a major project waiting to happen. The only thing that I like is the door, which I cover in all manner of pictures which are meaningful in some way to me. H.E., It's impossible not to like a girl who knows the value of a nice pot of tea. Neal, I am not shocked. Some people work just fine in "awful" offices. Mine is an aweful space too! It's literally wall to wall books (even on the treadmill) LOL...I can't use it if I'm using it to store stuff...Mwhahha! Hey! I see that live plant...Does the poor thing know that you're "Brenda the Plant Killer" LOL! Stop trying to make me feel guilty, Bonnie. My flowering houseplants last as long as they last--and then I get new ones. No more agonizing over Where I Went Wrong. Life is too short to spend it despising myself just because I forget to water a plant now and then!